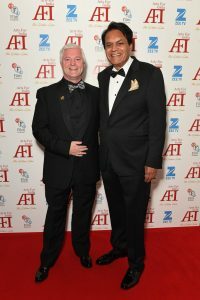 What an incredible evening at the Arts of India The Golden Gala at BAFTA. 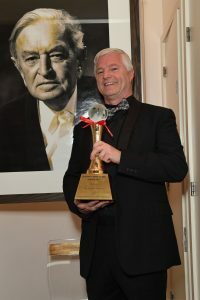 Tonight the work we are doing at SQ Foundation was recognized when Arts for India presented founder Derek O’Neill with the Dayawati Modi Global Award 2017 for his contributions in the field of philanthropy. “I am honoured to bring light to the subject of giving, a message that deserves all our attention and delighted to work with the Arts for India, to raise much needed funds for students, so they too can thrive through education.” said Derek O’Neill. Derek first went to India 15 years ago and after witnessing extreme poverty and the lack of basic necessities such as food, education, and healthcare, he decided to build his first orphanage and school. Soon after, Derek opened another school and within the first year over 700 students were given access to education. During this period Derek had become a successful psychotherapist, author, wellness workshop leader and opened Creacon Wellness Retreat in Wexford Ireland – he then decided to allocate his own earnings to build a self-sustaining system to nourish impoverished communities in India.The project prioritized access to food and safe drinking water, then introduced education and healthcare in the form of medical clinics and mobile surgical support, and then established a full-service hospital. To date, Derek and SQ Foundation have helped between 30-35,000 people and countless animals. His most recent project is a fully accredited college in the Andra Pradish district. Derek is also part of the team making a movie called ‘Jesus The Untold Story’ and an associated wellness workshop, where people can use the teachings of Jesus, to heal painful experiences and challenges in their lives. Mrs. Dayawati Modi, wife of the founder, Mr. G.M. Modi, was a great philanthropist and an educationist. To commemorate her love for Art, Culture & Education, the Dayawati Modi Foundation instituted this award in her memory in 1994. The Dayawati Modi Award for Art, Culture and Education is presented annually to an eminent person credited with outstanding contributions in these fields. Past winners include His Holiness the Dali Lama, Mother Theresa and Richard Attenborough. Media wing of rajyoga education and research Foundation mount Abu rajashtan India,,,, rajashtan Foundation Canada… Jodhpur veer gorga dahaas Rator award..